The desire for authenticity in celebrity personae is an essential one for fans: it represents a search for a larger truth, proof that the star texts the public reads and sees are not fictional. Often, all the proof necessary is a hint of that which publicity cannot show—at least, as long as the private correlates with the other, more public layers. Watts says, "Scandal is the ultimate unveiling of truth, for it underscores the inauthenticity of much star discourse while simultaneously indicating that many things normally remain hidden." 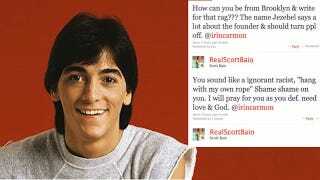 What did we learn about Scott Baio from him saying he paid taxes so lazy people wouldn't have to work, and getting called on it not by the staffers here, but by our readers and commenters? Or him calling us witches on brooms and racists? Or his wife cursing us out? Let's just say we're still waiting for our subpoenas from the Attorney General. I'm more clear about what truth was revealed in that exchange, not about Baio, but about you guys, the readers. The tomfoolery that followed — the Scott Baio Ruins everything Twitter hashtag and Tumblr, the Urban Dictionary alterations, the Wikipedia editing to call him the Antichrist — was premised on one thing, which is that an attack on one of us was an attack on all of us. After all, all Tracie did was post his nasty tweets verbatim; the rest came from the comments. And when Scott "my wife's best friend is black" Baio told me I was racist for using the phrase "hang yourself with your own rope," he was telling all of you too, or that's how it felt. That symbiosis isn't just for ridiculous has-beens to pick fights — it's also how we get inspiration for some of our best stories, whether through tips or discussions or throwdowns, for which I'm eternally thankful. Sometimes the interaction goes in another direction and someone we like makes a TV show about "this really cool feminist website where women talk about how far we've come and which celebrities have the worst beach bodies. (Ruth Bader Ginsburg!)" For the record, we've never done a worst beach bodies story, and RBG is my hero(ine). But I have gotten to do some work here I'm truly proud of (this and this come immediately to mind among the less-hilarious). All of these are reasons why I'm really going to miss this place and the amazing women who work here and who read the site. Today's my last day at Jezebel, but you can still always find me here, and starting in November, here. In the meantime, happy birthday, Scott, a day late — and good night, you lesbian shitasses.